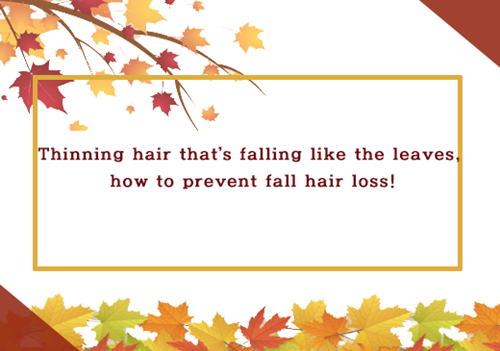 Thinning Hair that’s Falling Like the Leaves, How to Prevent Fall Hair Loss! [by Hwang Yeon-do] The fierce heat that seemed to last forever has passed and the fall with cool breeze is finally here. During the changing season with drastic temperature change in morning and night, many people worry about the thinning hair that falls like the leaves. Who said fall was the season of romance. Fall is a season in which people feel embarrassed by falling hair, so fall is often referred to as the “season of hair loss” and is even referred to as an “animal shedding season”. Why does your hair fall out more than usual during fall? Let’s take a look at the causes and preventive measures. Why do I lose more hair during fall? First, the summer environment >> Throughout the summer, intense sunlight, UV rays, heat and sebum caused the scalp and hair to become very weak. The scalp inflammation that occurs at this time weakens the hair follicle and shortens the hair cycle. Especially, those who have enjoyed the vacation often fail to remove swimming pool chlorine ingredient and seawater salt so it remains on the scalp which is likely to lead directly to hair loss in fall. Second, severe temp change and dry climate >> The temperature during and day and night are severely different during fall. Severe temperature change breaks the balance of the scalp and induces dead skin cell. When dead skin is accumulated in the pores, it can lead to hair thinning and hair loss. Third, the decrease in the amount of sunshine >> In the fall, the amount of sunshine is reduced compared to summer. As a result, the male hormone testosterone secretion increases temporarily in both men and women. When testosterone is converted to DHT by an enzyme in the body, hair loss and growth inhibition become severe, leading to hair loss symptoms. Recent hair loss hold no bias and appears on any age and gender. Some say it is the age of 10 million hair loss. 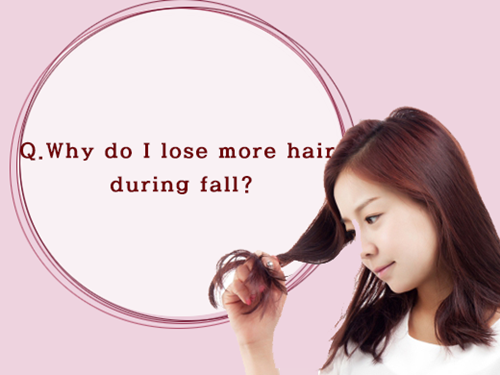 Especially because of the falling hair during the season change, many would have various problems. 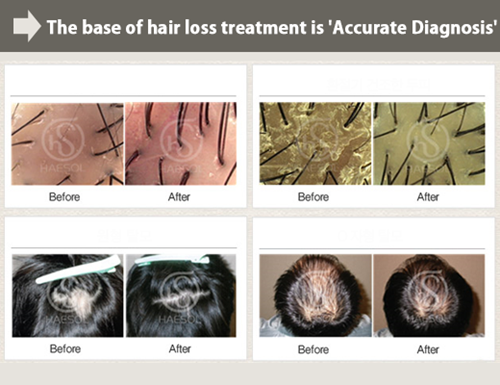 In fact, the first thing you need to do to prevent hair loss is to get ‘accurate diagnosis’. This is because it is necessary to understand if the hair loss symptoms are caused by seasonal changes or diseases, so that appropriate treatment can be provided. 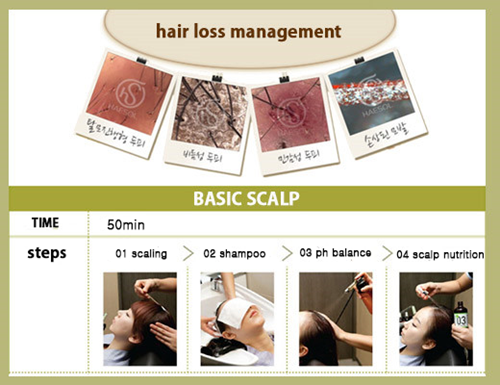 Haesol Scalp Clinics’s Sung Moon Sook, a representative of the Korean scalp management, said, “Many people have experienced the hair thinning during fall season and it can lead to baldness so it should be dealt with in the beginning stage. I recommend visiting a professional clinic to prevent hair loss in the fall through systematic hair and scalp management.” She stressed the importance of managing the scalp during the changing season. How to prevent hair loss during fall? Dried winds and climates in the fall cause the moisture content of the scalp to evaporate to accelerate hair loss. If you neglect scalp management during this time, you may need special scalp care because it can lead to habitual hair loss. Starting with scaling to remove aging dead skin cells, excess sebum, and dandruff Haesol scalp clinics remove harmful toxins from the scalp and normalize the keratinocyte cycle to improve scalp environment. When the pH balance is broken, the scalp and hair lose their elasticity and lose moisture retention function. Therefore, it is possible to improve the supply of scalp nutrition by adjusting the ion balance so that the constant pH is always maintained. Next articleHow to Appeal Sexiness with One Piece Dress!